For the past seven years I’ve belonged to an internet group called Fast Friday. Referencing Project Runway, we are issued a challenge and given a week to complete the piece. Thank goodness I have not been called to task on that as I would have sent that poor runway model down the runway in her underwear. Some of the challenges did not appeal to me but now I’m trying to get back in the swing of things and pressure myself to complete some small projects. 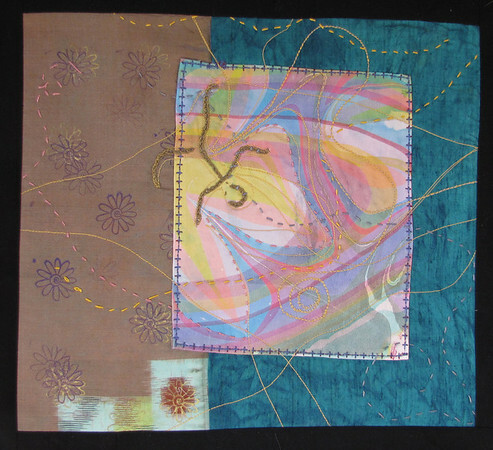 I’ve been working with silk backed with an interfacing which makes for very challenging stitching by hand–as I have had the good fortune to accumulate some gorgeous threads from Laura Wasilowski and also Elin Noble. The first piece which I think is most successful was to reference numbers in some way. 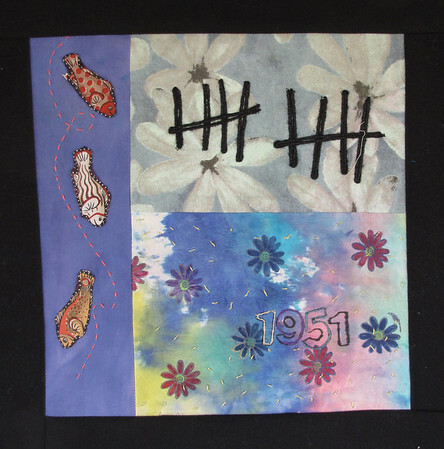 I used three fish to represent my birth month, the hatchmarks the day, but I could think of any way to illustrate the year without a lot of stitching. I suppose I could have resorted to Roman numerals–which might have made for a more successful and intriguing piece. However, I like to make pieces that are fun but make the viewer have to think a bit. The second piece is falling asleep into a golden swirl of sleep. There is a lot of hand-stitching on this piece–and a lot of blisters on my fingers. Pulling thread through interfaced silk is not for weenies.